Characteristics:1. This machine is a frame for assistant material on the back of the machine.2. The width of the assistant material is the same as that of the hand bar.3. The assistant material is cut into long and narrow strips to be conveyed to the folded top.4. This kind of conveying system adopts stepping motor with precision convey, cutting up and sealing. It can seal it just to the center of the bag.5. PLC made in Taiwan Weinview Brand. 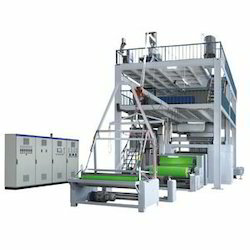 Looking for Non Woven Soft Handle Machine ?